Life with Aspergers: How to do more for families with autism than just being "aware" of it. How to do more for families with autism than just being "aware" of it. The idea of an Autism "Awareness" day is fraught with problems. 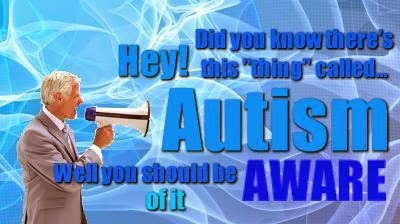 It suggests that people aren't even aware that autism exists, It's a very scary thought. It puts autism far behind most other forms of disability. There is no problem with the acceptance of blindness or deafness, of people with missing or damaged limbs or indeed, of most other mental and physical conditions. People have no difficulty believing in "invisible" (at first) issues like cancer, AIDS or MS but for some reason, the entire autism spectrum is subject to scrutiny. Everything from ADHD, to Aspergers to Autism is disbelieved. Raising awareness is a nice little idea which effectively means that people get to post little blue statuses or celebrate recognition because they've lobbied to light up national monuments in blue. The problem is that raising awareness of a condition does very little to improve the live of the people who live with it on a daily basis. In fact, in many ways, it could make things worse. One could argue that raising awareness does less to help people understand about autism and does more to make people aware that there is "yet another group of individuals lobbying the government for handouts". In that sense, maybe raising awareness is not such a good thing. I guess that you could say that raising awareness is an obvious first step but repeating the "awareness" exercise year after year does very little to address the problems. Once awareness has been raised, it's time to move on to other levels of engagement, like recognition, acceptance, then support and finally to issues of equality and sensitivity. Hopefully I'll get the chance to cover some of those things in other posts. Right now, I'm still trying to put the concept of "awareness" to bed. My point about awareness is that if you're not doing it right, then you probably shouldn't be doing it at all. Raising awareness in a negative manner helps nobody and usually causes significant damage. At best, poor awareness campaigns simply end up directing funds into the wrong pockets. At worst, they can turn the tide of public opinion against people with autism, can kick-start campaigns to strip away the rights of those with autism and can lead to "bad science" where anything from food allergies to radiation to immunisation and even to "poor parenting" can be considered to be a cause. Raising awareness - of anything, not just autism, is all about marketing. There needs to be a clear aim to the marketing (hint: it's not to "raise awareness") and there needs to be a target audience (again, not just "anyone"). Without these, anything "spent" on awareness is good time and money down the drain. Then there's the message. It can't simply be that "there is this thing called autism". It needs to be far wider than that. If your aim is to educate people then you need to have decided upon exactly what they need to learn. That message needs to be backed up by industry experts and really, for maximum impact, it needs to be supported within the autism community. Time spent encouraging or motivating a person with autism. These things cost nothing but they will mean so much more to your "target family" than anything spent on autism "research". You may even find that you get so much back out of the experience that you want to do it more often. I avoid the blue campaign, also. Great post, thanks for writing it, Gavin. I avoid the blue campaign, also. Great post, thanks for writing it, Gavin. Gavin, you are the best. and really appreciate your posts. This one really hits the nail on the head. Thank you! I felt somewhat bothered by the Blue Light Campaign and wasn't sure exactly why that was, but chose not to participate. I think it was mostly because I didn't understand what it was about. Your post has helped to clarify what it was that was bothering me. Thank you. Its great to see there are people that actually take a step back and thinking is lighting up monuments really doing any good? Loved your suggestions on what to instead to as they are really the best way to make a real life difference. This is a great article Gavin. I became severely stressed by the "Light it up Blue" day campaign this year because of the widely varying messages I was seeing from different parts of the autism community. Not helpful to anyone. Love your practical suggestions that can make a difference! "It suggests that people aren't even aware that autism exists, It's a very scary thought. " The first time I became aware of autism it was because I was participating in an Internet message board. A newbie jumped in and went on and on and on about how everything social was bad and he was so much better than normal people because he was autistic. Good thing I got curious and looked up autism for myself instead of taking that newbie's word for it.